wRC+ … Measures offensive production. Ballpark effects are taken into account. 100 is average, 150 is 50% above average, 50 is 50% below average, etc. FIP … Estimates a pitcher’s ERA based on strikeouts, walks, and home runs only. Let’s get to the comparisons! Behind the plate, the Dodgers have a couple options: Yasmani Grandal (102 wRC+, 2.5 fWAR) and Austin Barnes (142 wRC+, 2.5 fWAR). Barnes, also a second baseman, has likely earned the majority of the starts this series over his counterpart Grandal as a result of a stellar .408 OBP and 39 walks to 43 strikeouts in the 2017 season. The North Siders will, barring injury, assign the catching duties to 25-year-old Willson Contreras (121 wRC+, 3.2 WAR). Contreras hit .276/.356/.499 in 117 games during the 2017 season, in addition to well above average defensive play (6 defensive runs saved). His pickoff of Jose Lobaton proved to be a huge play in the NLDS against Washington, although it wouldn’t have happened without a controversial replay review. The Cubs also have former Tiger Alex Avila (124 wRC+, 2.5 WAR) available off the bench, but will be hesitant in using him as their only option after him is Kyle Schwarber. As one of the stories of the 2017 season, Dodgers’ Cody Bellinger (138 wRC+, 4.0 WAR) looks to play a huge role in the offense that now lacks Corey Seager. Bellinger, as a 22-year-old, slugged 39 home runs in only 132 games, slashing .267/.352/.581 with outstanding defense to go along with the bat. On the other side, Anthony Rizzo (133 wRC+, 4.0 WAR) brings consistent offensive production to the Cubs’ lineup. In his last four years, he has hit 32, 31, 32, 32 home runs. He walked more than he struck out, and hit .273/.392/.507 in 157 games, with excellent defense as well. This matchup will be a fun one to watch. Now we get into some unpredictable matchups for both sides. The Dodgers have options such as the aforementioned Austin Barnes, the former Tampa Bay Ray Logan Forsythe (90 wRC+, 1.7 WAR), the versatile Enrique Hernandez (92, 1.3), and the veteran Chase Utley (93, 1.3). We’ll likely see all four play second base at one point or another this series. For the Cubs, manager Joe Maddon will have to choose between his man Ben Zobrist (82 wRC+, 0.3 WAR) and fan-favorite Javier Baez (98, 2.2). Most of the starts at second will likely go to Baez, despite going 0-for-the NLDS and striking out 28.3% of the time in the regular season. Zobrist will get some pinch hit at bats and some starts in the outfield, however. To add to the Dodgers’ offensive threat, third baseman Justin Turner (151 wRC+, 5.5 WAR in 130 games) is one of the best hitters in the game and will get a chance to prove it. In an injury prone season, Turner hit an astounding .322/.415/.530 with 21 homers, more walks than strikeouts, and also saved six runs at third base. There’s nothing more to say about this guy. The Cubs have a match for Turner, and his name is Kris Bryant (146 wRC+, 6.7 WAR in 151 games). The reigning MVP will likely pick up more votes this year, and for good reason. Bryant slashed .295/.405/.537, while setting a career high in walk rate and a career low in strikeout rate. Bryant is also one of the best baserunners in the game (19 baserunning runs above average in three seasons), despite not being a huge base stealer. Shortstop is another questionable position for the Dodgers, as the news broke that Corey Seager did not make the NLCS roster, likely due to a back injury. This leaves Los Angeles with options like Enrique Hernandez, Charlie Culberson (who is not very good), Logan Forsythe, and Chris Taylor (126 wRC+, 4.7 WAR). For this comparison, I’m going to leave Taylor out of the equation as we’ll likely see him in left field for most innings, but it’s possible he gets a start or two at shortstop. 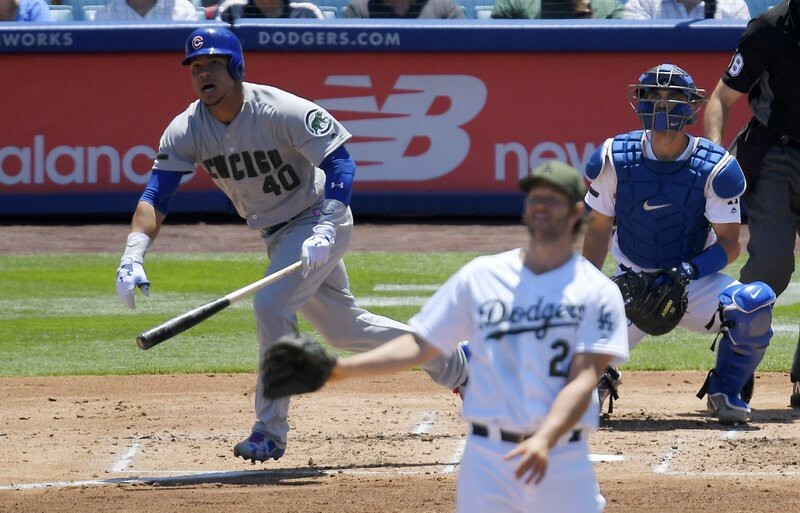 Addison Russell (84 wRC+, 1.4 WAR) has had a season to forget following injuries and off the field issues. In his three year career, he has averaged about 2.7 WAR per season, mostly from his outstanding defense (53 defensive runs saved in his career). Russell did slug .591 against the Dodgers in the 2016 NLCS. The Dodgers have a solid outfield, consisting of Chris Taylor, Yasiel Puig (117 wRC+, 2.9 WAR), Curtis Granderson (105 wRC+, 2.1 WAR), and Joc Pederson (100, 0.6). First baseman Cody Bellinger is also an option to play in any outfield position if need be, but we’ll likely see him predominantly at first. The Cubs’ outfield is not as great, but is still around average. Options include Ben Zobrist, Ian Happ (113 wRC+, 1.8 WAR), Jon Jay (101, 1.6), Albert Almora (103, 1.2), Kyle Schwarber (102, 1.5), and Jason Heyward (88, 0.9). Almora, who kills lefties (.342 average in 2017), will most likely platoon with Schwarber, who is much better against righties. Ian Happ didn’t play a huge role in the NLDS, while Jason Heyward and Ben Zobrist saw a lot of playing time. I’d expect some more of the same this series. This will be a fun series if you are a fan of pitching. The Dodgers have the best one in the game in Clayton Kershaw (2.31 ERA, 3.07 FIP), Alex Wood (2.72 ERA, 3.32 FIP), Rich Hill (3.32 ERA, 3.72 FIP), and recent acquisition Yu Darvish (3.86 ERA, 3.83 FIP). The Cubs only homered twice in the NLDS, and it won’t get any easier against this staff. The Cubs rotation is great as well, although some pitchers are having down years in 2017. Recent acquisition Jose Quintana (4.15 ERA, 3.68 FIP) gets the nod in Game 1, with Jon Lester (4.33 ERA, 4.10 FIP), Jake Arrieta (3.53 ERA, 4.11 FIP), and Kyle Hendricks (3.03 ERA, 3.88 FIP) following him up. While not as elite as the Dodgers, don’t overlook this Cubs rotation who locked down the Nationals in the NLDS. The Dodgers bullpen is basically “Kenley Janesen, and other good pitchers”. Jansen, who posted a 1.32 ERA in 2017, will do whatever necessary to get the save. Others include Brandon Morrow (2.06 ERA), Luis Avilan (2.93), Tony Cingrani, Ross Stripling, Josh Fields, Kenta Maeda and Tony Watson. Have fun with these guys after their outstanding rotation. The Cubs don’t have as many options as Los Angeles. Closer Wade Davis (2.30 ERA) highlights the pen, with Pedro Strop, Carl Edwards, Jr, Brian Duensing, Mike Montgomery, and Hector Rondon as other mostly reliable options. However, they had some trouble retiring the Nationals’ lineup. The Cubs have a slight offensive and defensive advantage, but the Dodgers pitching is a level above that of the Cubs. It’ll be an extremely fun series to watch, and the real winners are sure to be the fans!